Why street artists are livid about four new murals in East London and near the 2012 Olympics infrastructure. London street artist Sweet Toof has always seen East London's walls as his playground. He's watched them evolve for nearly two decades (and contributed some of his own work too). Last summer, he and other artists were up in arms over London's graffiti crackdown. 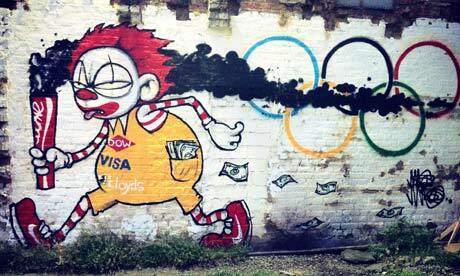 Officials painted over subversive works that mocked the Olympics and corporate sponsors. Now, the city is trying to make amends -- sort of. The Canals Project recently commissioned four new murals along the prominent canal walls that run through East London and adjacent to Queen Elizabeth park. The problem? Unlike the street art that was there before, these pieces have been officially sanctioned. Worse still, the artists selected hail from countries like Brazil, Sweden and the Netherlands. No Brits has made for a very upset group of local artists. London street artist Mau Mau told the Guardian that the decision is "disrespecting local people's creativity," adding, "they paint it all gray for the Olympics, then when it suits them, they choose who paints where." Mau Mau is particularly sensitive to that, because one of his pieces (depicting an overweight Ronald McDonald and a polluting Coca-Cola torch) in West London was painted over by Ealing Council. East London and the canals that run through it have long been seen as an ideal spot for street art. Only recently gentrified, the former industrial area provides an ample supply of urban canvases for murals -- both legal and not. The neighborhood is also home to an impressive number of art galleries and studios, a scene that has evolved organically over the last couple of decades. As for the Canals Project contribution to East London's walls, Mau Mau sees it as "part of a whole culture of graffiti gentrification," telling the Guardian, "there is a general respect between artists – people paint around each other and are careful about what they paint over. But with the commercialization of street art, it's becoming pay-as-you-go wall." Sweet Toof lamented to the Guardian that the Canal Project's new murals are covered in anti-graffiti paint, meaning "we all have to look at them for the next 10 years. It completely goes against the spirit of street art." Chief Executive Sarah Weir (who also ran the arts and cultural strategy for the 2012 Olympics) says the project was deliberately designed with an international emphasis that continues "the spirit of the Olympics." The four foreign artists were chosen by curator Cedar Lewisohn, who organized Tate Modern's 2008 Street Art show. And Legacy List officials say they will continue to work closely with the neighborhood, organizing workshops and events to encourage local participation, and artists from the area are always encouraged to propose ideas for events. The project is planned to extend to 20 different walls along the canal by 2020. As London's street artists, the Canals Project will send two of them to Poland and Brazil this fall for artist residences.